Ashavahishta completes the production of long awaited Goth Video of "Sweet Agony, Pt. I" after two and half years in production. This video released on 7/17/2017 (3 Sevens day!). X DOT 25 Music releases "Darvish" and "Ecstasy" by Ashavahishta from the album "Awakening Album Release Concert"
The new Album "Awakening" (Realization of a sacred dimension of reality!) is released! 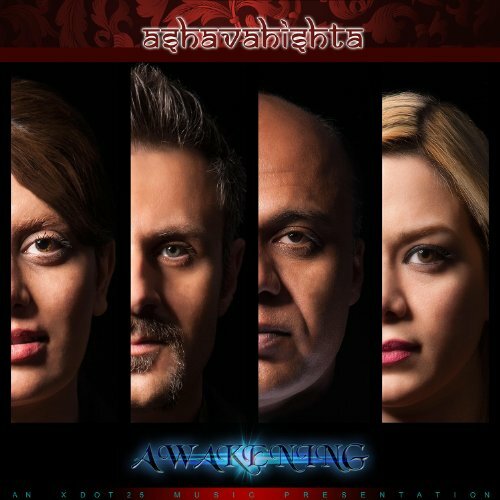 The World Trance Group Ashavahishta's release Awakening contains 12 songs which melt the words and wisdom of Rumi into a tapestry of vocals in a trance-ambient environment. This work includes soaring and sonorous vocals (two females and two males) and master musicianship; mesmerizing, lush, dense, textural, dark, mysterious soundscapes with global rhythms and contemporary sounds that constitutes a compelling and groundbreaking release! X DOT 25 Music is a 24 years old record label who brought you Axiom of Choice and Mythos among several other Avant-garde artists, Ashavahishta World Trance Group is the most recent act joining X DOT 25 Music with the introduction of a new tangential instrument, Benju! Ashavahishta is an old Persian/Avestan word, meaning "The Best Truth". Asha Vahishta ("excellent order") is the personification of the "best truth" and protects the physical and moral order on earth. He is the most prominent of the (male) Amesha Spentas and the principal adversary of the world of the demons. The second month in the Persian calendar is dedicated to him. Ashavahishta has been changed into "Arta Vahishta", "Arda Vahishta" and finally "Ordibehesht". تو بی رخ زرد من ندانم چونی. . .